That’s what’s promised with a new smartwatch called the PowerWatch from Matrix Industries—a company that seems appropriately named given how humans were used as power sources in The Matrix movies. So how exactly does this technology work, and why isn’t every gadget powered this way? 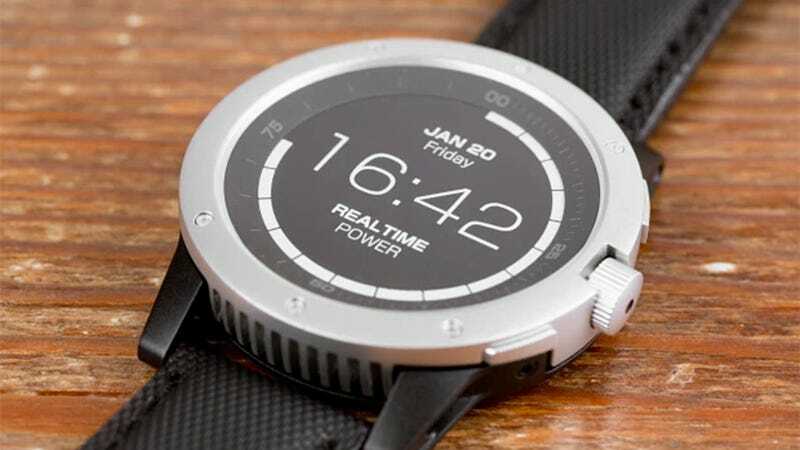 The creators of the PowerWatch are using the device as a proof-of-concept for their thermoelectric generator technology, which they’ve managed to make small and efficient enough to incorporate into a device as compact as a watch. Other products like this exist, such as BioLite’s CampStove which can charge your phone while it burns sticks and twigs. But the PowerWatch needs nothing more than for you to wear it. In order for a thermoelectric generator circuit to work, one side requires a constant source of heat, while the other side needs to remain much cooler. The important factor is the temperature difference between the two, which is why the technology works so well when integrated into a watch. The human body does its best to remain at a constant internal temperature of 98.6 degrees Fahrenheit. That heat propagates out to the skin, where it can be absorbed by the back of the PowerWatch while it’s being worn. On the other side of the watch is a metal housing and crown, with heatsinks disguised as part of its design, that help it to remain considerably cooler than the side touching the wearer’s skin. As long as that temperature difference exists, the smartwatch is able to generate all the power it needs to run. When the watch isn’t being worn, it automatically goes into a low-power sleep mode, powered by an internal battery, so that it maintains the correct time and date until you put it back on again. When it comes to smartwatch features, the PowerWatch isn’t quite as robust as the Apple Watch, or a wearable running Android Wear. It can sync to a smartphone over Bluetooth, ensuring it’s always set to the correct time zone, or allowing the wearer to customize its watch face. But there will be no smartphone notifications popping up on your wrist, which is a major feature for a smartwatch to be missing when even basic fitness trackers let you keep tabs on who’s trying to contact you. But one feature where the PowerWatch excels is when it comes to fitness tracking. Because the smartwatch is so dependent on the wearer’s body heat for power, it’s also able to accurately track how many calories have been burned during a workout, given their subtle fluctuations in body temperature. Other fitness tracking wearables track calories burned by extrapolating data from a heart rate monitor and motion sensors, but the PowerWatch’s unique thermoelectric technology give it a big advantage when it comes to accuracy. So how can you get one? The PowerWatch is being made available through an Indiegogo crowdfunding campaign which gets underway today, requiring a contribution of $170 for a pre-order that’s expected to ship sometime in July of next year. It’s important to remember that’s a best case scenario, and any number of unforeseen manufacturing problems could delay the PowerWatch’s arrival. But the company will be showing off a working version of the watch at CES, and we’ll be checking it out in person to see if the technology can really deliver as promised.